Have you watched someone give their “testimony” on a TV show and describe being at their lowest point when they became a Christian? Did you shake you head and have the same reaction as the words at the bottom of the graphic? Once, I would have been in your camp. After all, that is the easiest, fastest response, right? So here’s a challenge: skip the path of least resistance, the path that our culture pushes us onto, and really think about this. Perhaps someone said “I found God at the most vulnerable point of my life” because they suddenly realized that all the ‘stuff’ that’s supposed to be so, SO important is really trivial. Maybe they realized that in the midst of their vulnerability, nothing that our culture offers us really changes anything. Oprah can’t help. Friends sending out ‘positive vibes’ makes no difference. And drugs or alcohol will eventually leave them even worse off than before. Perhaps they figured out that our culture’s focus on being self-reliant in everything just doesn’t pass the smell test. It’s not realistic. 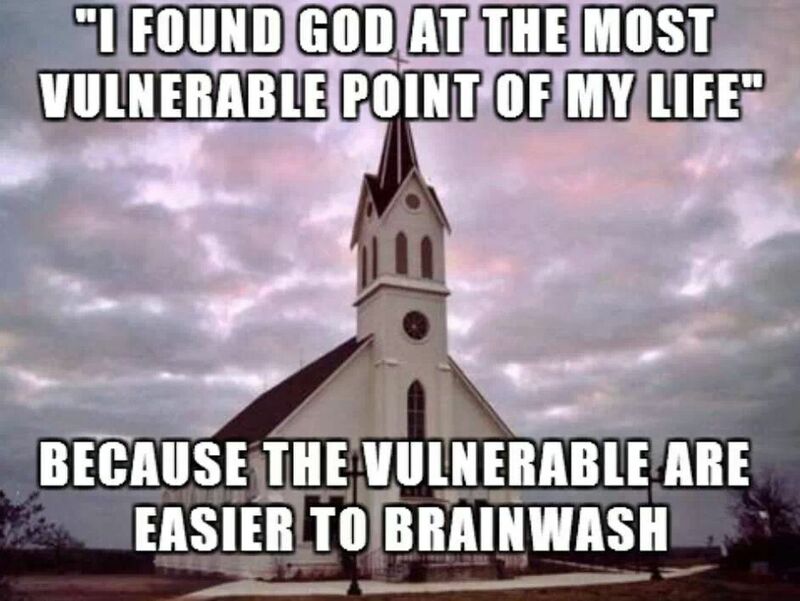 Maybe their vulnerability has made them realize that dismissing/ignoring God and Jesus Christ (whom serious Christians, and many others, believe is His son) is, in fact, brainwashing. And for the first time, they’re seeing life — and what could happen when this life ends — outside of our culture’s narrow and shallow confines. I was in my 40s when I stepped off the path of least resistance and really thought about the how and whys of people deciding to follow Jesus. I wasn’t at the most vulnerable point of my life. In fact, I was doing just fine, by the standards of our culture. I had a decent career, parents who didn’t abuse me or abandon me, several meaningful romantic relationships, no serious diseases and a good future. But I knew there had to be more to life than all this. I knew there had to be something deeper and something that would look beyond 80-odd years on planet earth. After much reading, a lot of thought and many debates with brave Christians, I decided to become a follower of Jesus Christ. That decision had — and continues to have — a profound impact on my life. It greatly affected who I decided to marry and where I now work. It gave me hope — not in things or in people (the first is meaningless and the second will disappoint and hurt and abandon) — but in a creator who offered me the gift of His Son. I accepted that gift. Have you ever thought about doing the same? Yes or no, post your thoughts below and let’s have a conversation. Yes…. Even I have faith on the Almighty lord…. God is, was, and will always be the only true constant in our lives. His love is what all of us need whether we admit it or not. If God had not intervened when He did in my life, I would be dead. Period.